RSC is a perfect venue for Open or National Championships.Racing can be held at all states of the tide, and both inshore and offshore sailing can be provided. Carrick Roads provides the perfect venue for Championship and Open Meeting fleets of up to 80 boats in sheltered and safe waters. 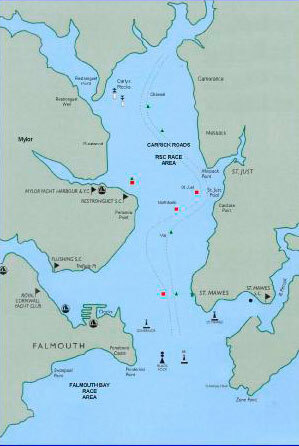 Falmouth Bay can be used for larger fleets wanting more open water and is, at most, only a 30-minute sail from the club. The club has excellent, clean and modern, facilities comprising purpose-built changing rooms, kitchen, clubroom and bar. The boat park, to the rear of the club, holds some 150 dinghies and there is ample of land available at nearby Windsport to accommodate the fleets. Nearby Mylor Marina has recently developed its extensive shore amenities and offers excellent chandlery and launching facilities, along with a popular restaurant, wine bar and café. The club can also provide a purpose-built committee boat (launched in 2012) and three RIBS with full rescue/saftey facilities. Highly experienced race officers and crew will be provided to make your event a safe and successful one. We can accommodate a range of requirements from a weekend Open up to a full-week Championship Meeting. An example package might include: racing in Carrick Roads or Falmouth Bay, comprising 2-3 races per day; dinghy and trailer parking; campsite facilities; Commodore’s reception; bar facilities etc. Regatta costs are quoted on a per event basis.